GpgOL is a program extension for Microsoft Outlook; it integrates the operation of GnuPG into Outlook. Since Outlook is a proprietary product, hence is not available as free software with a source code, this integration still has a number of issues. In other words: Operation is not as comfortable as offered by, for example, e-mail programs with integrated encryption and signature components (e.g. KMail/Kontact). Once Gpg4win has been intalled, S/MIME functionality is activated in GpgOL. This refers to the S/MIME support of GnuPG. Outlook itself also supports X.509 and S/MIME, but of course does not work with the Gpg4win component GnuPG. This means that all settings, certificate management and user dialogs will be different. Please also note that Outlook itself does not offer any OpenPGP support. 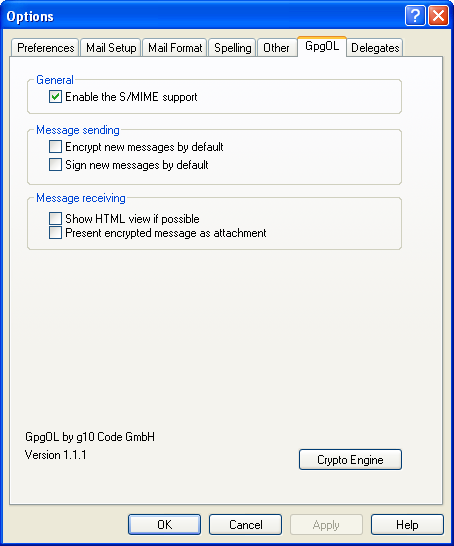 If you wish to use S/MIME with Gpg4win in Outlook, leave the GpgOL-Option Activate S/MIME support activated. If you wish to use S/MIME supported by Outlook, deactivate this GpgOL S/MIME option. These two options control whether new messages are encrypted and/or signed with the default settings. You can also change these settings when you create a message. Only the buttons are activated accordingly. This option can be used to display the HTML version of a message. Normally, or if HTML format is not available, the message will be shown in text format. The encrypted portion of the message is also shown as an attachment. This means that users can save the encrypted part separately, or process it in another manner. All options are already pre-populated following a new installation. 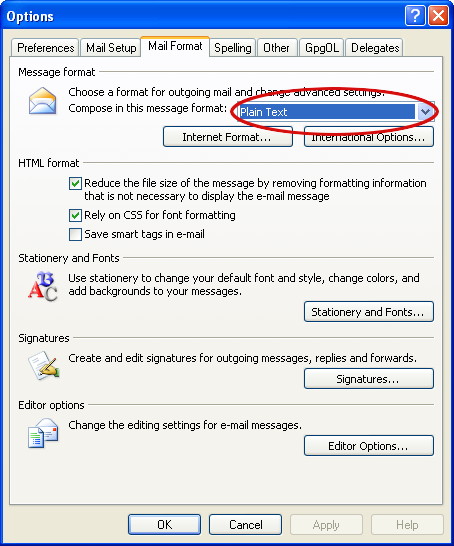 To send encrypted messages using Outlook, you have to ensure that you do not use Microsoft Word to compose messages. It is also recommended that you do not use HTML messages. These items can be controlled in the menu item Extras -> Options on the E-Mail format tab. The message format should be set to Text only (see highlighted area). However, if you still want to use HTML for signed or encrypted e-mails, it is possible that the formatting information will be lost by the time the message reaches the recipient. Please note: The program extension GpgOL from Gpg4win makes it possible to handle e-mails according to the OpenPGP standard in Outlook 2003/2007. In WindowsXP and Outlook 2003, Gpg4win also enables Outlook 2007 to decrypt and create AES encrypted S/MIME e-mails, since along with GnuPG, Gpg4win brings along its own cryptocomponents that are independent of Outlook and Windows. Only Outlook 2007 under Windows Vista can handle AES encrypted S/MIME e-mails without Gpg4win.